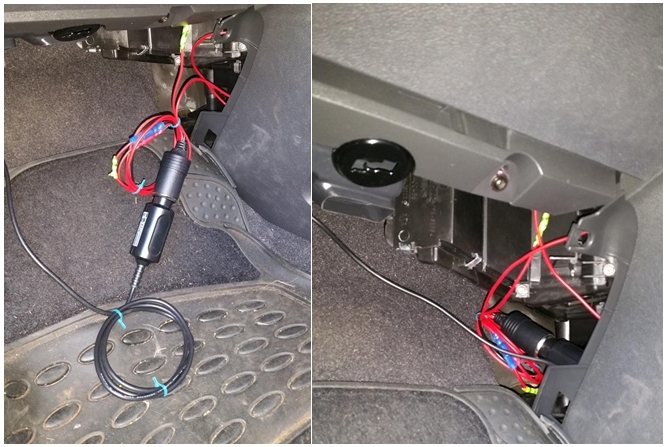 The Zafira B's cigarette lighter is always powered, so I didn't want to risk the dashcam draining the battery and I wanted to keep the socket free for other uses. Bicycle tyre levers x2 (optional but helpful). First ensure that the camera’s wire is long enough to route from the mount point, along the roof liner, down the pillar trim and in behind the glove-box. 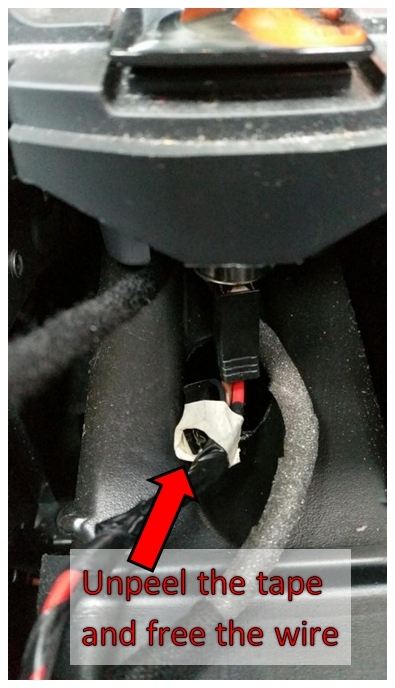 Remove the small plastic panel under the gear stick by locating the hole, putting your finger in and pulling out then up. After this, remove the coin tray by pulling firmly upward at the rear, near where the handbrake arms meet the panel. It will unhook from its locating points at the front. The coin tray has the aux connector attached and it’s a little tricky to get this detached so I just pushed it to one side. 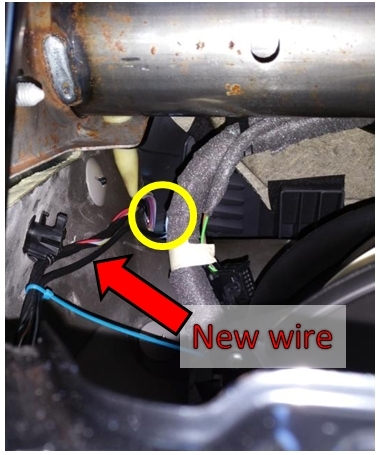 Underneath, you’ll see the cigarette lighter connector and a small black connector taped to the 2 cigarette lighter wires. You must ensure the black connector is present. 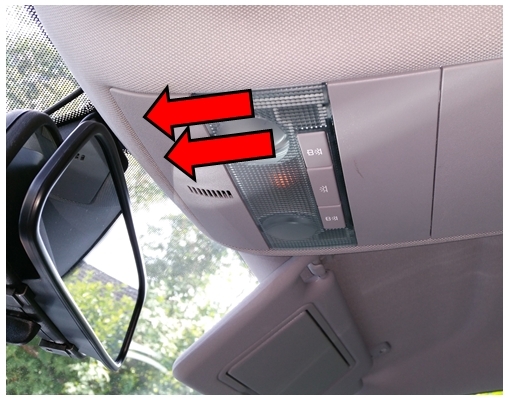 A word of advice, this panel needs to be removed BEFORE you remove the glove box. If you miss it like I did, when you reinstall the glove box your panels will be all out of alignment. 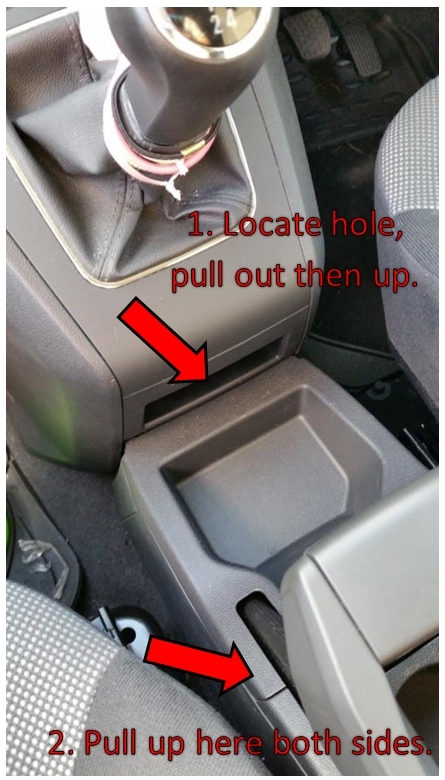 Pull the door rubber back and ease the panel away from the glove box. There are two metal clips and a plastic locating lug. It takes a little effort to get this piece off. 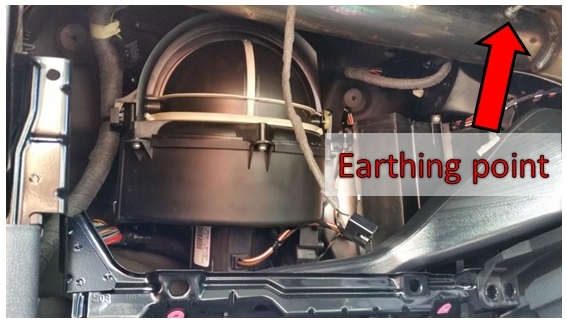 Under the glove box is a trim panel with the lower vents in it. You need to remove the two large plastic screws. They hand turn anticlockwise and drop out. Don’t dig them out with a screwdriver or you’ll break them. 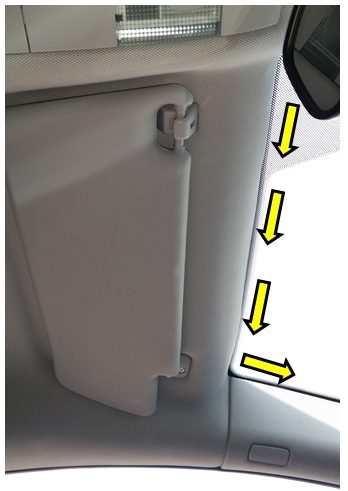 Once removed, pull the panel downward and away from the centre console. 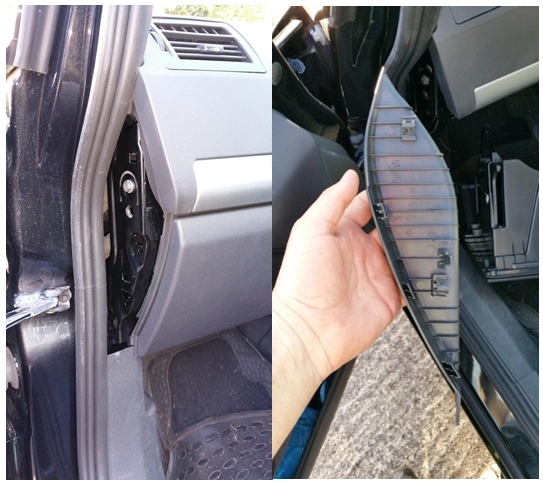 To remove the glove box you need to remove four T20 screws. 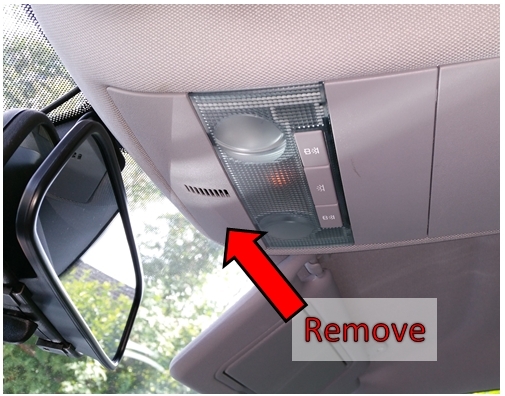 Two are at the top inside the glove box and two are below, behind the lower panel you just removed. Once you've removed the panel you’ll see the first two T20 screws. Remove them with a T20 Torx headed screwdriver. Hint: Put the screws somewhere safe so you don’t lose them down the side of the seat. Open the glove box and undo the 2 screws at the top. Prepare for the glove box to potentially drop out. 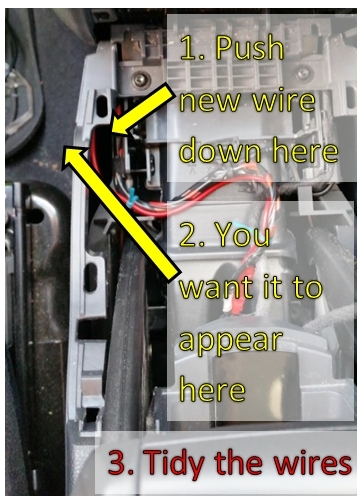 Before you pull the glove box all the way out, be careful of the light on the top right otherwise you’ll yank the wires out. 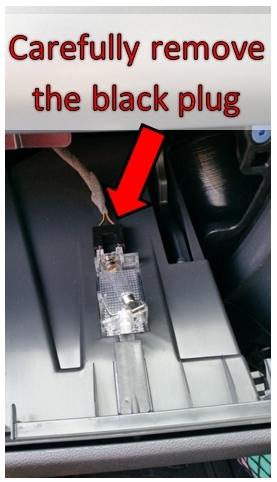 Disconnect the black plug then you’re free to remove the glove box. Make sure it’s shut and just pull firmly to remove it. The view inside with the glove box removed. 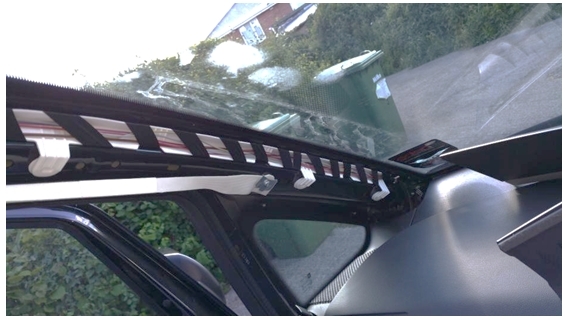 Next job is to remove the A-pillar trim panel between the windscreen and the door. To do so you need to gently prise the top blanking plug out (1). I used a bicycle tyre lever to avoid damaging the plug or the trim. Once the plug has popped out and you can get a grip on it, pull firmly and the top of the panel will release (you don’t need to pull the plug completely out of the trim). 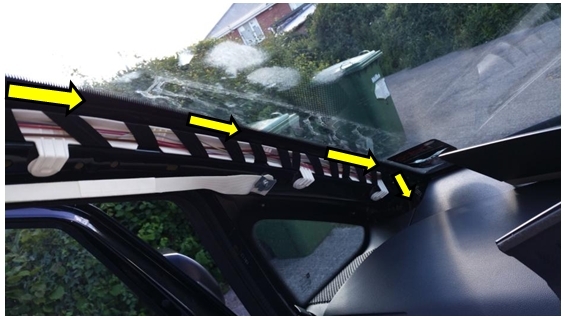 Pull the trim panel out toward the driver’s side (2) and then up, away from the bottom where it meets the windscreen (3). It’ll look like this underneath. 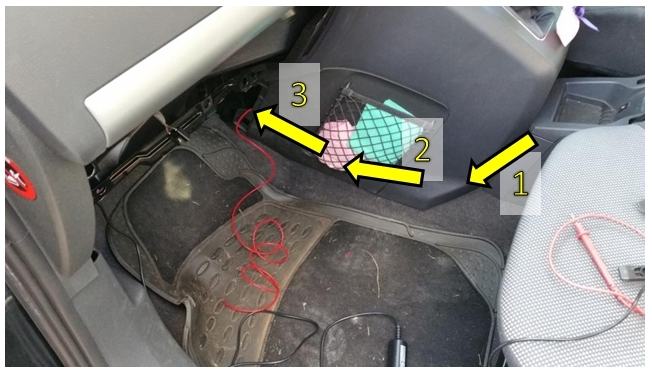 The white strap is the curtain airbag retainer and the car’s wiring runs inside the white plastic channel. 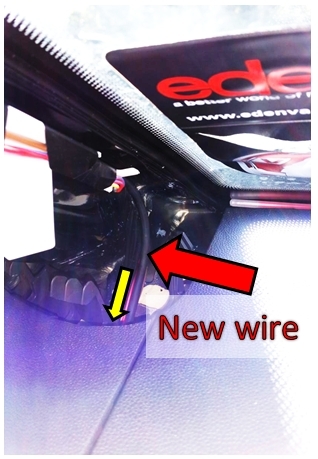 You will be aiming to run your new wire inside the gap between the windscreen and the white channel. Remove the front head liner plastic trim by gently pulling at the corners. You can do this with your fingers but again, a tyre lever is useful. You’re going to remove this to make it easier when it comes to running the wire under the headliner. Now that you've confirmed everything is correct and all panels are removed and as per my pictures, you can begin with the wiring. Inside the black connector is a female spade terminal. The terminal is smaller than a standard female spade, so you cannot push a normal male spade into it whilst it’s inside the black connector. Thus, you need to remove the black connector block to expose the female spade terminal. Take a length of wire long enough to run down the side of the centre console into the glove box area and allow a bit extra for safety. Connect a male spade to the end and join to the exposed female spade. 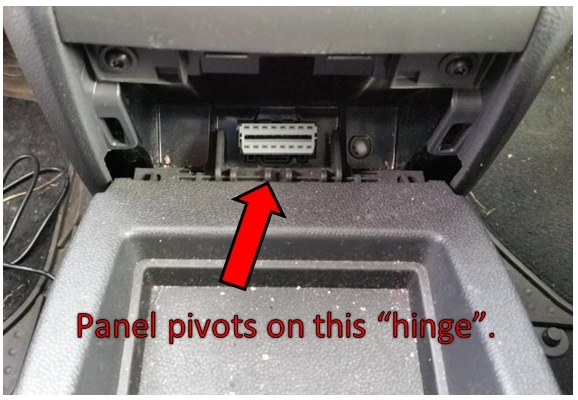 Push the new wire down the side of the panel so it pops out in the passenger footwell. 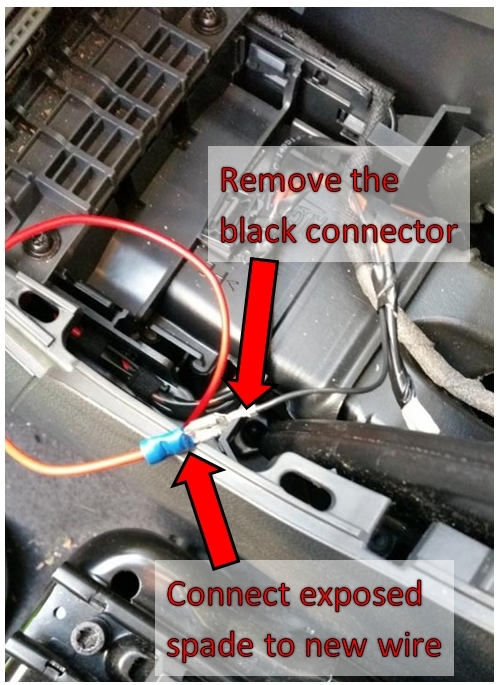 Run the wire down the panel by the seat (1) then push it up under the side panel (2) and out under the glove box (3). I’ve already re-fitted the coin tray etc at this point. Now take a piece of new wire and fit a crimp eye to the end (check for size against the bolt on the earth bar first). Attach this to the mount up on the earth bar – 10mm spanner required. I wrapped a bit of earth tape around it for identification (because I was out of earth sleeve), but you can do whatever takes your fancy. Now it’s time to run the wire from the camera down to behind the glove box. 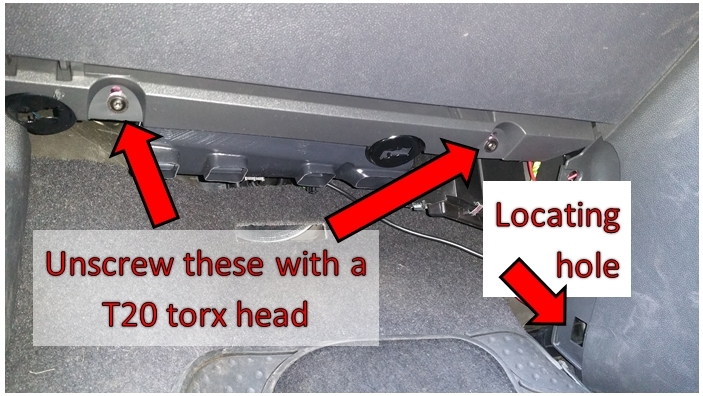 Mount your camera to the desired location (normally behind the rear view mirror) and route the cable up under the headliner. In the below you can just see the wire for the camera running up under the headliner. 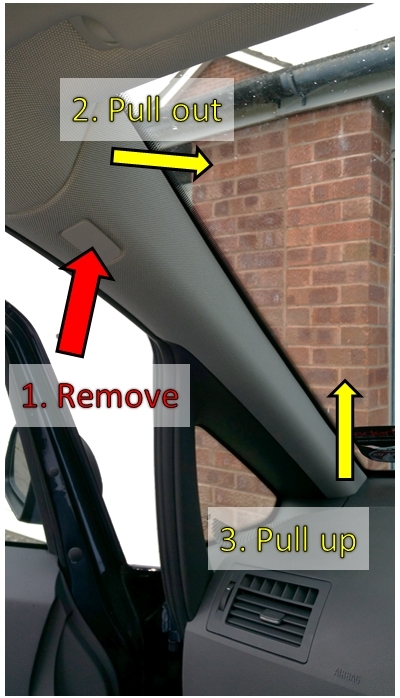 To get it here, push two fingers into the exposed hole as per the arrows, and pull downward to pull the headliner away from the screen. This creates enough room to get the cable run started. Your aim is now to run the cable along the headliner in the direction shown. Again, a tyre lever is helpful here in prising the headliner away from the roof, and for pushing the wire up inside. Continue to run the wire from the camera along the inside of the down the inside of the windscreen, up under the plastic channel containing the other wires. 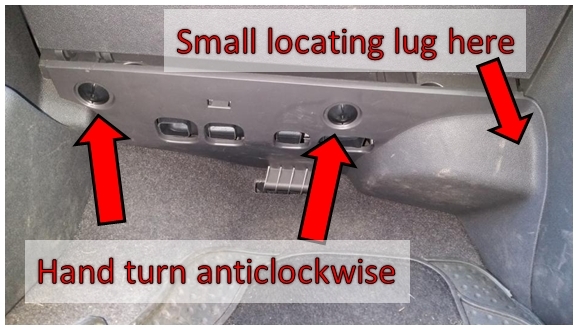 If yours doesn't have a big fat cigarette lighter plug on the end, you may even get it inside the channel with the wires without too much trouble. 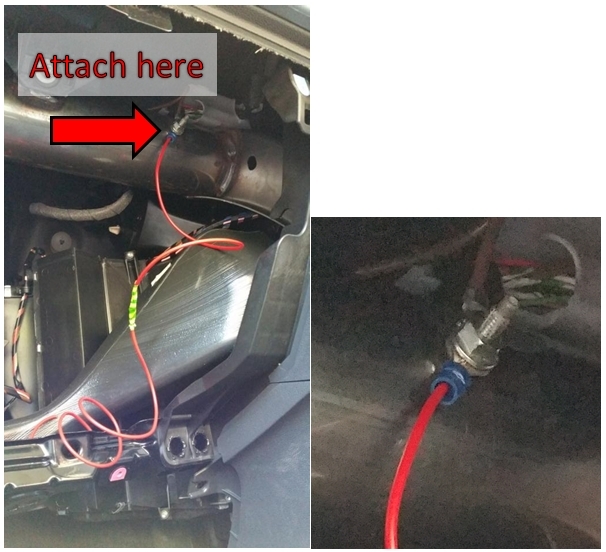 Drop the wire down into the gap where the other wires are running and it’ll appear in under the glove box void. This is the view looking up to the windscreen from below. 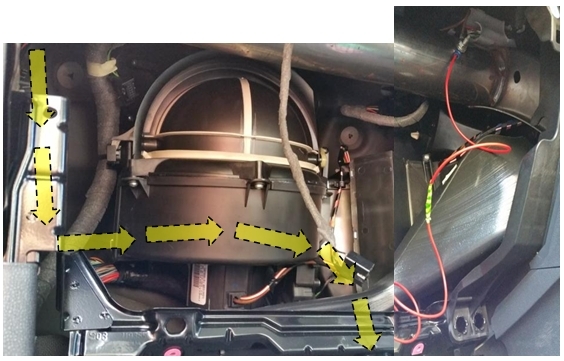 The circled area is where the wires enter from. Your wire is now located down the left of this picture (looking into the glove box hole), just out of view. Your aim is to route it around so it doesn't obstruct anything. You can get it to fit in behind the fan if you’re dexterous enough. Arrows indicate the (obscured) route of the cable I’ve already positioned. 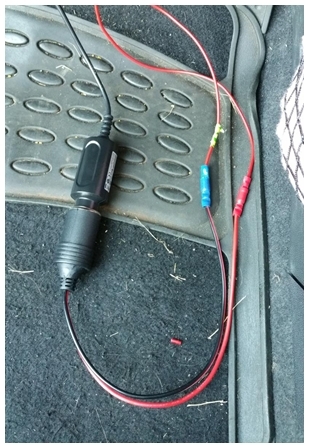 You should now have your plug end of the camera wire in the passenger footwell, along with the two new wires you just installed. 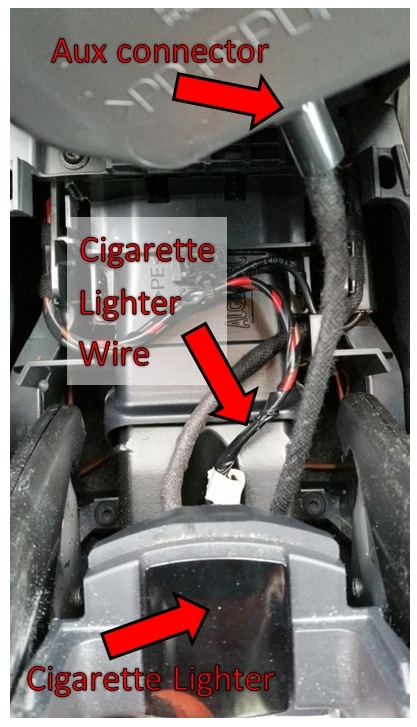 Take the new cigarette lighter socket and connect terminals to the ends to the two bare wires. I chose bullets because they’re tidy. Connect a bullet to each of your new wires (from the cigarette lighter and the earth bar). Join the wires to the cigarette lighter. Turn the ignition on and test the new lighter for voltage. You should get 12v when ignition on, nothing when ignition off. Plug the camera into the lighter and turn the ignition on. Your camera should jump into life. Turn the ignition off and it should switch off again. Coil the wires up, and tuck them in behind the centre console. All there is left to do now is tidy and replace the panels, put your tools away and enjoy a nice cold beer!